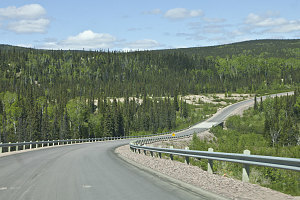 The Trans-Labrador Highway is the only through highway of any kind in Labrador. 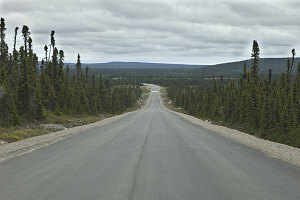 If you wish to travel anywhere by road in Labrador, there is only one highway available - this one. In my investigation into my own trip along this highway (as part of my "Overland to the Rock" road trip), I discovered that there are a lot of questions about this highway, but only a few web sites that describe it. This page is my own detailed description of the Trans-Labrador, from a purely logistical point of view. 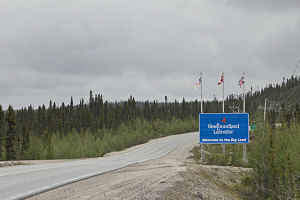 My description of the highway starts in the west, near Labrador City, and ends in the south, at the Quebec border near the town of Blanc Sablon. 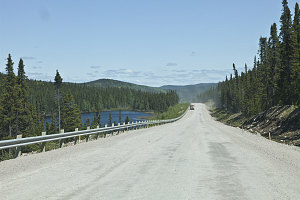 You should remember that large stretches of the Trans-Labrador are still gravelled; additionally, there are long stretches with no services (most importantly, no gas). You must keep an eye on your vehicle's fuel level when setting out on any of these remote stretches, and know where the next service station is located. 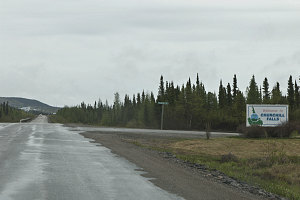 The western end of the Trans-Labrador highway starts at the border of Quebec, where it connects with Quebec highway 389. 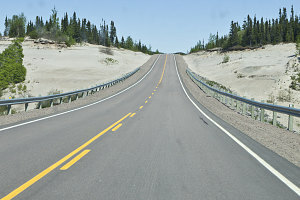 Highway 389 is one of only two ways to reach the Trans-Labrador Highway by road, and many travellers use it to approach from the populated regions of central Canada. If you are interested in seeing my in-depth description of highway 389, please click here. 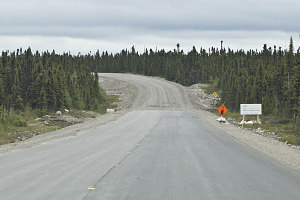 The western end of the Trans-Labrador highway is signed as highway 500, and is paved. 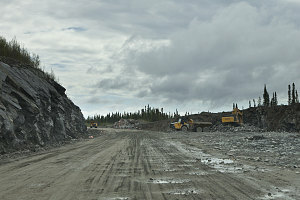 The highway leads east, and in short order (about 17km from from the border), you reach the mining town of Labrador City. There are services, a mall, restaurants, etc. in this town. 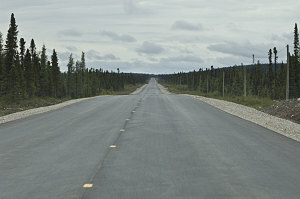 Heading east out of Labrador City, highway 500 is nicely paved. 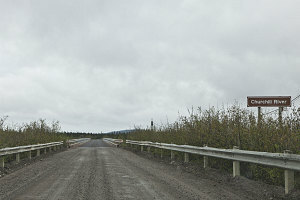 This is a new section of paved road (as of 2011), and continues this way for about 80 kilometres east of town, until it turns back to gravel at the 98km mark. 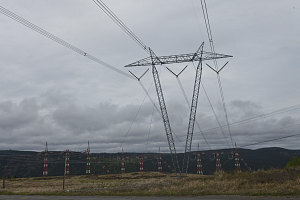 This point is likely to change, since as of the summer of 2011, there was active road construction and upgrading being done on highway 500. I would not be surprised to see additional sections being paved going eastwards over the next few years. 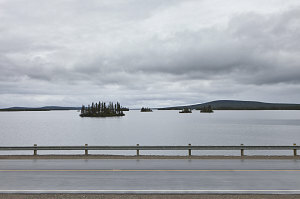 The gravelled road continues east over slightly rolling terrain and through short black spruce forest. 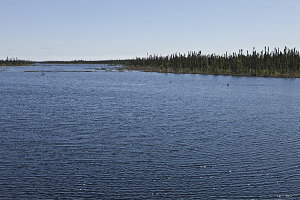 At the 238km mark from the start of the highway, you reach a narrow one-lane bridge over the Churchill River. 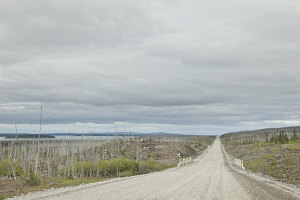 There is a parking lot on the right just before the bridge where you can park, take a short trail, and have a look at Churchill Falls itself (click here to read more about that walk). 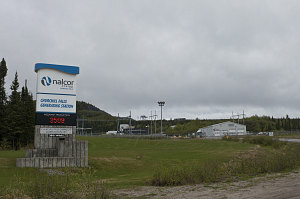 About 25 kilometres further along -- kilometre 261 from the western end of highway 500 -- you arrive at the community of Churchill Falls - a company town for Nalcor, the provincial energy company that runs the Churchill Falls hydro-electric generating station. There are services here - a gas station and a small convenience store. There is also a restaurant at the town's community center. 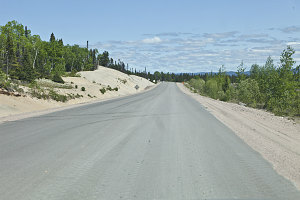 Highway 500 is paved for a short stretch in the vicinity of the town. 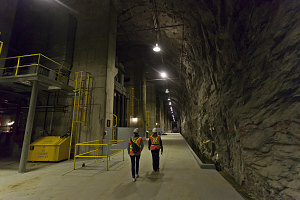 If you are so inclined, there is an excellent free guided tour of the underground generating station. Click here to learn about how to book a tour. 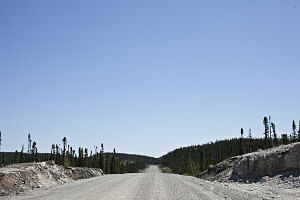 Heading east out of Churchill Falls, highway 500 becomes gravel. 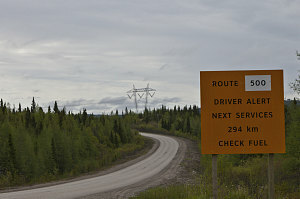 There is a big warning sign stating that the next services are in Happy Valley-Goose Bay, almost 300km further east. 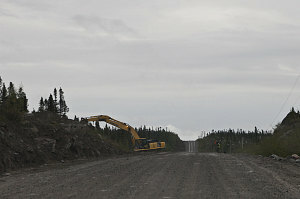 As with the section of highway 500 east of Labrador City, there is a lot of road construction underway east of Churchill Falls. 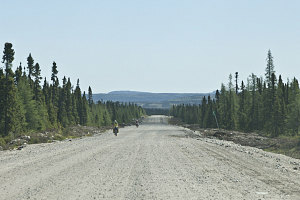 I suspect that a section of newly-paved highway will soon result, but as of summer of 2011, it is still dirt and gravel. 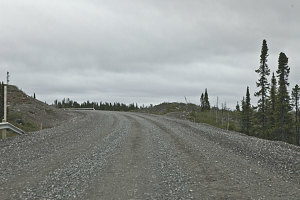 Although the road is still gravel (again, as of 2011), the quality of it is not too bad, with relatively few potholes and an aggregate size that is not too coarse. 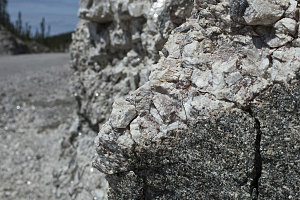 The terrain, which has been fairly flat for the last few hundred kilometres, becomes more varied and hilly. 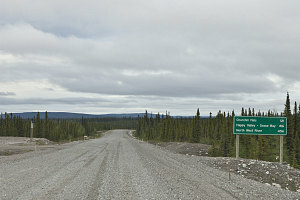 At around the 460km mark (as measured from the western end of highway 500), the road starts to descend into the valley of the Churchill River, which it then follows all the way to Happy Valley-Goose Bay. 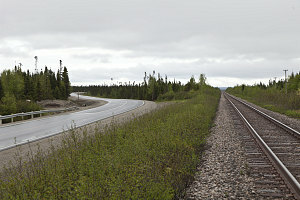 Shortly thereafter, at around km 466, the highway becomes paved, and remains that way all the way to Happy Valley-Goose Bay. 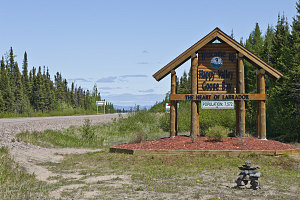 540km east of the start of highway 500, you arrive at the welcome sign for Happy Valley-Goose Bay. This is also where the junction with highway 510 is located. 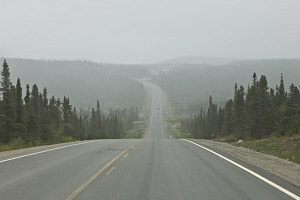 Highway 510 is the southern section of the Trans-Labrador, and is covered in detail on page 2 of this report. 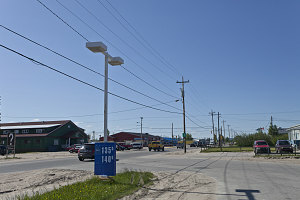 To actually enter the community of Happy Valley-Goose Bay, drive a few kilometres further east on highway 500 until you reach a junction. 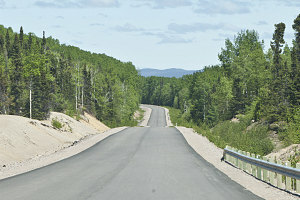 Left leads into Happy Valley, and right into Goose Bay. There are several gas stations and other services available (and which you should take advantage of if you are intending to continue south on 510!). 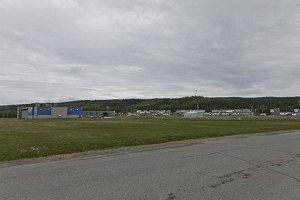 The total distance from the western end of highway 500 to Happy Valley-Goose Bay is about 550 kilometres.